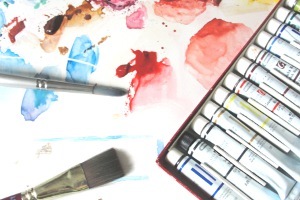 Do you know what watercolor art supplies you need before you start painting? High quality and sufficient watercolor art supplies will ease your learning curve as you develop your watercolor painting ability. 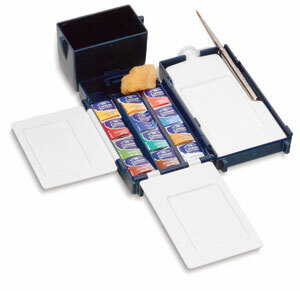 In the overview below, I walk you through the essential watercolor art supplies you will need. Watercolor paints come in three forms: pans, tubes, and pencils. Different artists prefer different formats, but to start with, you can probably do without watercolor pencils. 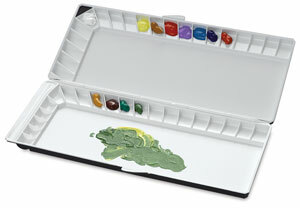 Watercolor pans are dry paints shaped to fit in custom-made compartments on either a plastic or metal palette. They allow you to travel light. I own a watercolor travel set that allows me to order refills for any individual pan. They are economical, and I love them because they are extremely portable. How do you work with watercolor pans? First, you moisten your brush slightly and dig into the color. Take your loaded brush to the mixing palette and add more water. If the pan cracks due to extreme dryness (because you let it sit there for ages), you can soak it in some water for a while before using it again. If you have good quality watercolor pan colors, rewetting should be not a struggle. Tubes store water color paint in a moist state and are perfect for working indoors. They work equally well for painting outdoors, too. You squeeze out some of the pigment each time you want to paint. When you are done, you can leave the excess there on the palette and re-wet it when you work next time, or even better, use a palette with an airtight lid. Many manufacturers list the degree of lightfastness on the side of the paint tubes. Look for pigments with the top two ratings. Also find out whether the watercolor paints are transparent or opaque colors. It should be indicated on the packages with a big “T” for transparent or “O” for opaque. Transparent colors are suitable for glazing or layering, because, like the name suggests, they allow the layer underneath to show through. Good quality transparent watercolors can be mixed in several layers before the mixture gets muddy. Opaque colors are chalkier and do not allow the underlying color to show through. They have good covering power, however. When you mix an opaque color with transparent colors, the opaque pigment can overpower and push weaker colors around. So watch out for that. Another property of watercolor paints is their staining ability. A strong staining paint stays on the paper and sinks into its fibers. As a result, a strong staining pigment is difficult to lift off the paper. It can drastically affect the color under it when used as a glaze. So when you glaze, only use a small amount of strong staining water color; a little will go a long way. Some paints have coarser pigments. The sediments from these paints tend to settle in the small valleys of the water color paper, resulting in a textural effect. How many colors to use? A question to come up when a lot of people shop for watercolor art supplies. You want to have at least two colors from each primary family (blue, yellow, and red) to start with, and then add whatever colors you like. You do not need to buy brown or earth tones because you can mix your own. I recommend starting with a limited palette of high quality colors, rather than buying a lot of cheap colors that make your paintings too busy. My favorite brand for travel is Winsor and Newton artist's field set. These are high quality paints that let me capture the scenes I want. For working indoors, I have used both tubes and water color pencils. I think watercolor pencils are wonderful for small detailed illustrations, but they are not necessary if you have a good set of small brushes and masking fluids. Sable brushes with soft hair are the mainstay of watercolor brushes. They hold water well, and the hair will spring back easily, unlike some cheap student-grade brushes. Since brush strokes in water color painting are often readily visible and not easy to remedy once they dry, it is important to have both good brushes and the skillful control (that comes with practice). Good water color brushes are great investments among the watercolor art supplies; they can last for years if well maintained. You want to have a few flat brushes for covering broad areas. You can also rotate them to paint narrow lines. As a result, they are useful for creating either broad or very narrow brush strokes depending on how you hold them. You also want to get some round brushes of various sizes. 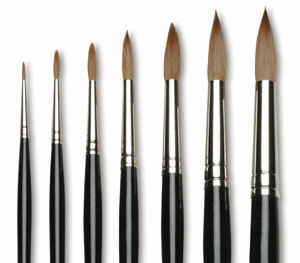 If you do very detailed work, then you should have some round brushes in the number 1 to number 4 range. Bright and filbert brushes are also recommended, if you can afford them, but I recommend you stock up with flats and a few rounds before you add other types. Over the years, I have enjoyed using Loew-Cornell synthetic brushes because they are long lasting and hard wearing. They are also very flexible and economical, too. You might consider them as alternatives to sable brushes. Different brands, weights, and textures of watercolor paper all have a huge effect on your painting. In fact, you should not skimp on watercolor papers, even if you compromise on other watercolor art supplies. You can only salvage a poorly painted watercolor, or recover from a mistake, when the paper is top quality. So, take some time to experiment with different options, and spend the money to get the right type of paper for your painting. You can find water color paper in many formats: single sheets, packs, spiral notebooks , blocks, or on rolls. It is most cost effective to order standard full size sheets of paper.These measure 22 by 30 inches (56cm by 76cm). Some brands also come in much larger sizes. Shop around and buy in bulk to find the best deals. As you shop, keep your eye on the weight of the paper. Watercolor paper comes in many different including 124lb, 130lb, 140lb (300gsm) to 300lb (649gsm). 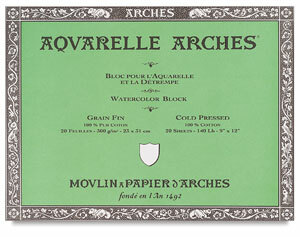 Many watercolor artists use at least 140lb paper. If you are doing a large watercolor painting, 140 lb and up is preferred. I like 140lb because it is sturdy and absorbs water quite well; it does not buckle like the other lighter weight papers. Textures also vary with different watercolor paper. Hot pressed paper is the smoothest watercolor paper, with little or no tooth. Water and paint tend to skid around on the smooth spots, which can create unpleasant drying patterns. Some experienced painters, who have learned to control these effects, prefer this type of paper, but if you are just starting with watercolors, this is not the paper for you. You can minimize or increase the effect of the texture by varying the amount of water you use. The slight valleys of the paper hold the pigments in place quite nicely. Rough paper has the most textured surface and is very durable. Even with a lighter weight, it still has sufficient roughness to hold both water and paint quite well. The use of watercolor medium is optional. Personally, I never found need for it, but if you want to try it, the most common one is gum arabic. It is the binder in watercolor paints that makes them transparent and glossy. So if you want to beef up the transparency and increases the gloss, it can be done with gum arabic. Gum arabic also works as a retardant; it slows down the drying time. It also allows you to have better control when spreading colors while working wet into wet. I prefer a white plastic palette with wells and a lid. There are both rectangular and round shaped palettes. I personally like rectangular plastic ones that are easy to carry and will fit into my backpack when I travel. The choice of a palette is very personal. Take your time too to think about your needs. Will you expand your color choices later? Will it fit your lifestyle and painting practices? If you are in a pinch, a white porcelain china plate or a styrofoam palette will work just fine. Just make sure they last and don't crack. The trick to successful palette use is to always keep the paints moist (i.e. don't let them dry out). Masking fluid is a very helpful tool in watercolor art. It allows you to have more control over edges in your painting, and it can also be used to protect larger areas from being painted (until you're ready). Masking fluid is usually a white liquid latex solution. There is also tinted mask available. The color helps ensure you will not miss a bit when removing the mask. Do read the instructions on how to apply it correctly so that you don't end up ruining your brushes, the paper, or the painting itself. In addition to the above mentioned watercolor art supplies, you might want to add some sketching supplies to ensure the accurate drawing underneath. A number 2HB pencil for initial sketching and an eraser. I also use a regular school 2H pencil which works just fine. A spray bottle for reviving dried paint on the palette or for creating special effects. Water containers: you need one for mixing the colors and one for cleaning the brushes. Rag and sponges for lifting paint from the paper, cleaning up, and dislodging paints from brushes. Paper towels and tissues for cleaning up and lifting paints from the paper. Easel? Did I mention an easel? Watercolor paper needs to be mounted and supported on a board. Then you can place it on a drafting table, or an easel that will tilt to an angle which allows you to control the water flow. Support board- a lightweight board provides sturdy backing while painting. Stiff cardboard or foamcore can be used for smaller works. Gather up your watercolor art supplies and explore more about watercolors!